Will A 3% Yield Crash The Stock Market? - Some have suggested that a 3% yield on the 10-year Treasury will undermine the bull market in stocks. - While long-term interest rates at 3% may not be competitive with stock dividend yields, there are economic ramifications to consider. - I expect the long-term rate to decline from current levels before breaking above 3%, but when they do rise to that level, it will be a significant headwind for stocks. As the 10-year Treasury yield returns to its December high of 2.60%, breaking out of the downward channel it has been in since that time, I am debating with myself and others how high this interest rate must rise before it derails the bull market in stocks. Additionally, what factors might fuel such a rise and would higher long-term interest rates be sustainable in such a slow growth environment? Long-term interest rates soared following the presidential election in expectation that pro-growth policies from the Trump administration and Republican-led Congress would lead to faster rates of economic growth and inflation. While we have seen an uptick in inflation, due predominately to the rise in energy prices, expectations for fiscal stimulus have waned since the end of last year, as the repeal and replacement of Obamacare has taken center stage. In response, the 10-year Treasury yield gradually declined from its December peak until last week. The very recent increase in 10-year yields seems to be a function of market expectations for another increase in short-term interest rates by the Federal Reserve at its meeting next week. I suspect that the view that we will see faster rates of economic growth and inflation later this year has been emboldened by the Fed's intent to raise rates again, which could lead to even higher long-term interest rates and lower bond prices. Investors could also be selling bonds and reallocating funds to stocks, which they think will benefit from faster rates of growth and inflation. Yet at some point, a continued rise in long-term interest rates will become a significant headwind for the stock market, but at what level? At the beginning of this year, Bill Gross asserted that a 10-year yield of 2.6% is the line in the sand. He said that if we break that level to the upside, then the bull market in bonds that began in 1987 will have ended, and we are likely to see rising yields and lower stock market valuations. Jeff Gundlach dismissed the relevance of 2.6%, instead surmising that "there will be trouble for equity markets" if the 10-year yield rises above 3%, because investors will then be inclined to reallocate from stocks to bonds. From the perspective of a stock investor, I don't agree with Bill Gross or Jeff Gundlach. I am not going to sell my AT&T (NYSE:T), Qualcomm (NASDAQ:QCOM) or Unilever (NYSE:UL) just because the 10-year yield is 3.2% or 3.3%. I certainly won't sell the Exxon Mobil (NYSE:XOM) that I recently purchased. These stocks all have yields that are competitive or higher than a 10-year yielding better than 3%. Still, there are factors to consider other than simply comparing the yield of a stock to a bond, including the ramifications of higher interest rates for the economic and corporate fundamentals that support the stock prices. This requires looking at the stock market from a different perspective. Should the 10-year yield rise above 3%, it will result in a measurable increase in borrowing costs for consumers and businesses at a time when we are beginning to see cracks in the foundation of the economic expansion. Auto sales have been a major contributor to the rate of growth in consumer spending, as well as orders for durable goods, during this expansion. Outstanding loan balances have soared above $1 trillion. 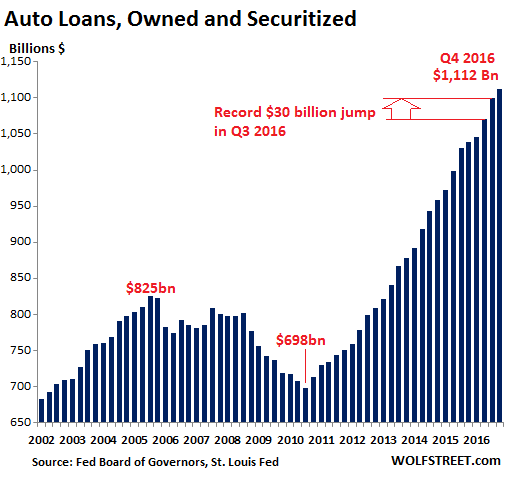 Driving this economic activity have been historically low borrowing costs and easy credit conditions. 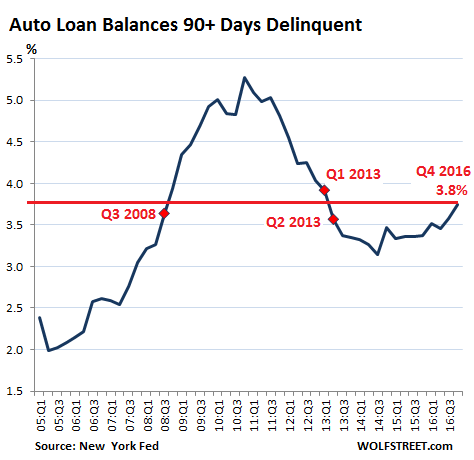 Now we are starting to see delinquencies rise, which will only be exacerbated moving forward by rising interest rates and tighter financial conditions. The housing market recovery has also been a critical factor in this economic expansion, but now we are starting to see indications of weakness there as well. Federal Housing Administration mortgage delinquencies rose in the fourth quarter of last year for the first time since 2006. These are the types of loans that first-time home buyers typically use because of the low downpayment. If first time home buyers are not able to participate at the rate they have been, then it will limit the ability for existing homeowners to sell and purchase higher-priced homes. The higher mortgage rates that would result from a 10-year yield greater than 3% would severely worsen the recent slowdown we have seen in existing home sales and limit the number of first-time home buyers entering the market. This is because mortgage payments would increase at a much faster rate than the median income required to make the payments. I realize that investors are reveling in the Bureau of Labor Statistics' rough estimate that 235,000 jobs were created in February, but it is the increase in real income, rather than jobs, that fuels consumer spending. Consumer spending accounts for two-thirds of our economic growth. If higher interest rates stymie the growth in auto and home sales, then the rate of economic growth in the US will slow substantially. It will provide no incentive to businesses to increase capital expenditures, because corporate revenue growth will also slow. This would also undermine the brief profit recovery that we have seen over the past two quarters. For these reasons, a 10-yield of 3% or more could undermine the bull market in stocks. It is possible that we could see 3% this year, as this yield appears to be the next level of resistance on the technical chart, as can be seen below. 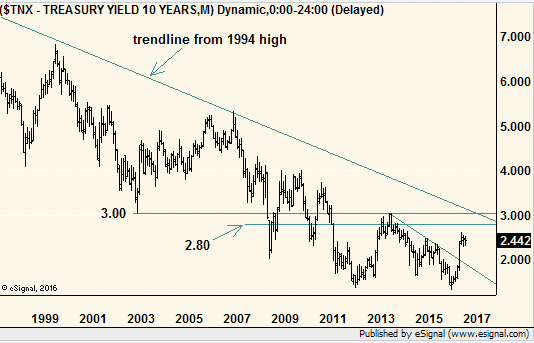 It coincides with the peak in yields we saw in 2013, while still falling below the downtrend line that dates back to 1994. Even so, the reason that I don't think it is probable we see 3% is that the rate of economic growth continues to slow, which is what the spread between the 2-year yield and 10-year yield implies, as it continues to decline from the December highs. I remain in the camp of those who believe the 10-year yield will fall back within a range of 2% to 2.25% before it rises above 3%. Regardless, I am focused on reducing interest-rate risk and improving quality within my fixed-income allocation. Another event that could instigate such a decline in long-term interest rates would be a correction in the stock market. 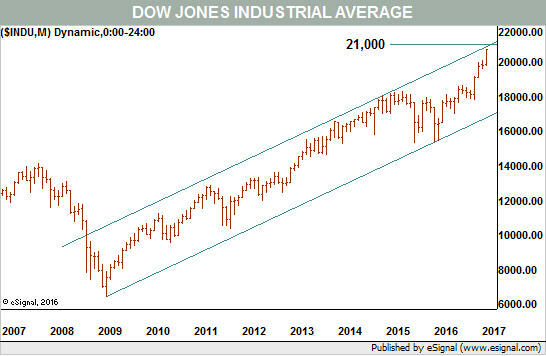 A consensus is building that the recent run-up in stock prices is overdone in the short term, with the Dow Jones Industrial Average (NYSEARCA:DIA) at the upper end of its rising cannel. In addition, other developments surely leave the most ardent of bulls questioning the resiliency of this market. Corporate insiders sold more stock in February than they have in roughly six years. The Daily Sentiment of Futures Traders shows that 92% are bullish, which is a level only reached three times since 2011, all of which were followed by pullbacks in the market. Lastly, the Investor Intelligence survey shows the highest percentage of bulls dating back to 1987. A correction in the stock market should lead to a decline in 10-year yields, but there are still other factors that suggest we will eventually see an end to the bull market in bonds, and with it, higher long-term interest rates. My greatest concern on that front is how fiscal policy will impact our deficit and debt, which continues to grow.